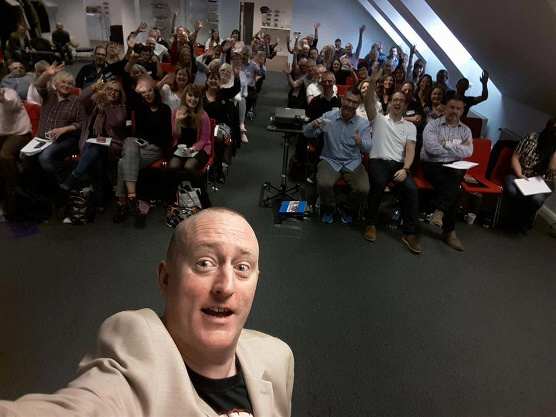 Whether you are an experienced Hypnotherapist or Mind Therapy Practitioner, a Mystery Entertainer, or involved in some area of the New Age & Spiritual community as a Healer or Psychic Consultant, this Unique One Day Accelerated Learning Workshop with Top Hypnotist Jonathan Royle will prove to be worth it’s weight in gold to you. No prior knowledge or experience of Hypnosis is necessary, as everything you will ever need to know will be taught in Royle’s Unique No Bullsh*t direct to the point easy to learn, remember and use manner! The easy and reliable way to conduct Profitable Past Life Regression Sessions both on a one to one basis and also for public performances & demonstrations. The use of Hypnosis for Future Life Progression & Creating a truly Magical Future. How to demonstrate Astral Projection using a simple Eyes Closed Relaxation Process that you will learn in easy to understand detail. The use of Pendulums both to Induce a Hypnotic Trance State in your clients and also to help them to overcome their Habits, Addictions, Fears, Phobias & other issues including releasing Traumas & Anxiety as well as effectively helping people to overcome & eliminate Pain from all areas of their Minds, Body, Spirit & Soul. Using Hypnotic techniques to run profitable Seances, Paranormal and Ghost Hunting events. Help someone to meet their Spirit Guide and gain inner strength and renewed positivity in all areas of life. Enabling someone to enhance their Psychic Powers so they can see Spirits and communicate with deceased relatives in a manner whereby it can be both entertaining for an audience if it were a public demonstration, whilst also being hugely therapeutically beneficial for them. The Magic of Candles & how to use them for Hypnotic Inductions as well as in a therapeutic manner to help clients achieve their goals, dreams, ambitions & desires in all areas of their life’s. Meeting your Power Animal, how to discover what your clients Native American Indian Power Animal is and how to help them benefit from this knowledge & experience. Mystical Power of Mirrors & how using a mirror during sessions can help your clients to experience positively profound long lasting & truly Spiritual & Magical changes. Numerous other Insider Hints, Tips, Tricks, Secrets and Techniques that will help make you a far better Hypnotist & Mind Therapist on all levels. The Three Most Powerful & Effective Suggestibility Tests on the planet. 4 Amazing Rapid Hypnotic Induction Techniques that work like magic! This package of Marketing, Advertising, Publicity & Promotional training materials and business building tools for Mind Therapy Practitioners & New Age Consultants usually retails at $497 (approx £385). Join International Psychic Entertainer & Fortune Teller Dr. Stuart “Harrizon” Cassels, one of only a handful of Psychic Entertainers to hold an Honorary Doctorate in Divination, for this intensive 1 day workshop which will help turn even the complete novice into a Confident, Competent & Highly Accurate Fortune Telling Consultant. This unique workshop constructed so that whether you are a Genuine “Shut Eye” Fortune Teller or an “Open Eyed” Psychic Entertainer, or indeed are new to these areas and would just like to add some profitable new talents to your tool kit, then this is the perfect event for you. The Meanings of all 78 Tarot Cards. How to Conduct Professional Standard Tarot Readings. The Meanings of the 52 Playing Cards. How to Conduct Cartomancy Playing Card Readings. The simple Numerology System that Harrizon regualarly uses to get bookings. The Meanings of the 25 Rune Stones & How to give Readings. Lazy Mans Guide to Star Sign Astrological Readings. Simple but highly effective Palm Reading techniques. Dendographology – Harrizon’s alternative option for sceptics in the room, looking for a personality reading. Powerful Secrets of Psychometry to give readings to people just by holding an item of their Jewellery, a photograph or a personal object. Insights into the most powerful Cold & Hot Reading techniques used by “Fraudulent” Psychic Consultants. How to heighten your own Genuine Psychic Powers to increase the accuracy of all the readings you give. 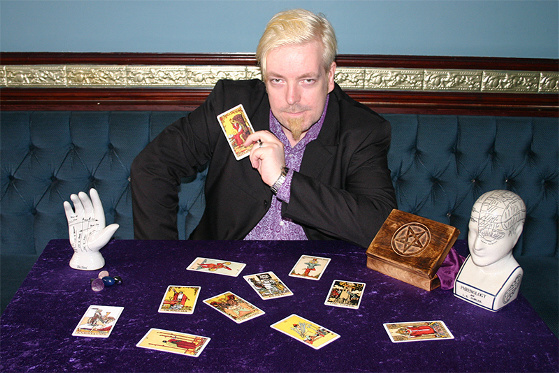 Stuart’s views on The Psychic Industry, and how to be an ethical Psychic Entertainer. How to integrate these techniques into any mind therapy sessions you may do for even greater results. Ways to attract a regular stream of clients paying you to read their fortunes for them on a one to one basis. The highly profitable secrets to running Tarot & Psychic Parties. Lucrative Secrets of breaking into the Corporate readings arena. Social media tricks to get noticed as the “psychic” expert in your field. Seating for this never to be repeated event is Strictly Limited, so to encourage you to take action and secure your place to join us in Chesterfield at Future House Therapy Centre on Sunday 14th October 2018, when you book today as well as a ticket to attend in person (or online via Zoom Video Conferencing) you will also gain access to this Amazing package of goodies.. This physical DVD-ROM details of which can be seen at this link usually retails for $77 (which is approx £59) and is yours Free when you attend this workshop. Take action now and instead of paying £97 for each day (a total of £194), you will SAVE £47 and pay just £147 for a ticket to attend both days. We are legally required under current UK law to inform you that all psychic and fortune telling activity, including demonstrations and teaching, is for entertainment purposes only.